reading: latest 'shopaholic' book by Sophie Kinsella. God I love hardback books! currently hating: back to college tomorrow, constant pain, my own stupid clumsiness. why the list: I like lists. Questions?! Ok i'll stop now. Promise. I do like lists though! So today has been a bit of a chill down day. Still in my pj's (oh the glamour) having pretty much spent the day dossing about not really doing much of anything. Feeling a bit glum I guess. Found out that some of my friends have already buggered off to uni before I had a chance to say goodbye to them. Fools. So this is what i've been working on. Stupidly. I have an absolute s*itload of things I should be working on (like commissions... come on Jade, get to work!) yet for some inexplicable reason i've been working in this bloody picture for the past two-and-a-half hours. Here's a sneak peek at it. And no, she isn't naked, the dress she's wearing is strapless. 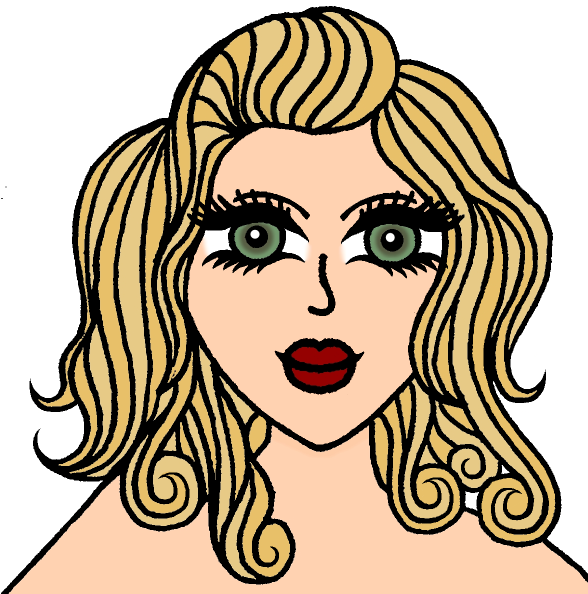 Currently debating whether to keep the pointy eyelashes or not. Oh and the nose needs fixing too obviously. I did say it was a sneak peek it's not supposed to be ruddy perfect! I gave up on this 'girl' when I first drew her a couple of months ago. I think it in was April or May actually. Oh well. I gave up because I had to start FMP but there's something about her I quite like. As I said above it's based on the Burlesque performer Immodesty Blaize, that's all i'm saying for now though. If I give the rest away it'll be too obvious. Stay tuned and all shall be revealed. Probably. Maybe not. We'll see. So yes, back to college tomorrow. Yay. I don't hate college, far from it, but there's something about 'going back to school/college' that has always depressed me, ever since I was little. While other kids spent the night before school excitedly packing their bags, looking forward to the imminent return to playgrounds and games lessons and exams... i'd sit in my room sulking and crying because I had to go back. Hopefully once i'm there i'll soon get back into the swing of things and start to remember all the things I like about it, here's hoping anyway! Oh by the way, I should probably explain the title of this post. I haven't got a new phone (I WISH) it's because I got a punnet of delicious blackberries yesterday. One word... YUMMY! No, sadly I still haven't gotten a new phone. Wandered into the local phone shop yesterday to enquire how much an iPhone 4 is... soon walked back out the shop. Without an iPhone suffice to say. Doesn't make me want one any less though! Stupid Apple... making things I want!